Once your read mapping completes, you are into the part of the assignment where analyses will run much more quickly. CLC Genomics has, literally, seven tutorials that you could follow to deal with all of the pieces of RNASeq and gene expression analysis. The parts we’ve already done — loading your data and mapping reads — are covered in Tutorial 1. We are not going to do all of the possible remaining steps. Let’s focus on a few important things. 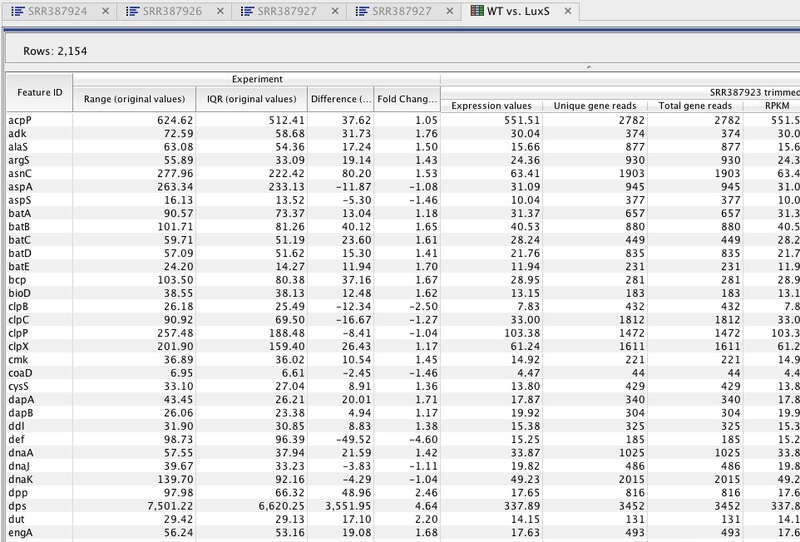 First, select the mapped gene expression results you just generated. Select all four samples. In the table, you’ll see that the first column is gene names and the 5th column is fold change. You can sort by fold change and scan through your data to see what things look like. You can calculate all sorts of things to add to your basic table. For instance, in Toolbox > Transcriptomics > Transformations and Normalizations, you can manually initialize different kinds of normalizations and log transformations, and apply them to your data. To obtain a heat map view, you need to run “Hierarchical Clustering of Features”. There’s one more short part coming.